Addressing the UN General Assembly (UNGA) in an informal briefing, UN Secretary-General Ban Ki-moon elaborated on plans for 2013 on five areas where “needs are greatest and where collective action can make the greatest difference”: sustainable development; prevention; supporting nations in transition; building a more secure world; and empowering women and young people. 22 January 2013: Addressing the UN General Assembly (UNGA) in an informal briefing, UN Secretary-General Ban Ki-moon elaborated on plans for 2013 on five areas where “needs are greatest and where collective action can make the greatest difference”: sustainable development; prevention; supporting nations in transition; building a more secure world; and empowering women and young people. 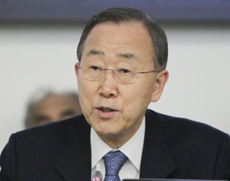 Ban outlined the ways the UN will address sustainable development in 2013, including the special event on the Millennium Development Goals (MDGs) to assess progress and discuss the post-2015 development framework, for which he will draw on the work of his High-level Panel (HLP), along with global consultations and other processes. He urged States to “inspire and mobilize the world” behind the creation of Sustainable Development Goals (SDGs). Ban also noted the upcoming preparations for the 2014 conference on small island developing States (SIDS), said the Sustainable Energy for All (SE4ALL) initiative will bring in more partners and pledges in 2013, and asked for support for his proposal to the UNGA for a UN Partnership Facility.